I have this thing about homemade gifts. I think they’re sweet. My parents used to make gifts for me when I was younger, most of which I still have. In fact, I still wear the fleece robe that my mom made me in high school almost daily. 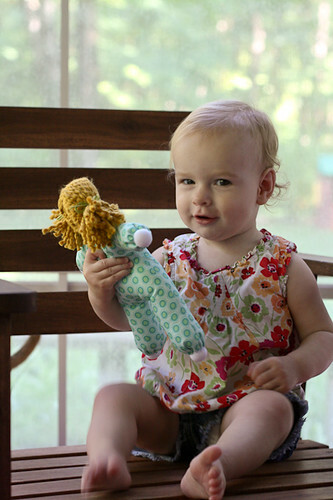 For her first birthday, I thought Lil needed her own doll. Inspired by the simplicity of Waldorf-style dolls, I followed these directions. It wasn’t a difficult project, but required a lot of hand sewing, which is not my fave. So I procrastinated. In the end, though, I finished two weeks after her birthday, leaving the finished doll on the couch before I went to bed. When Lilly discovered it the next day, the smile on her face made all that hand sewing worth it. 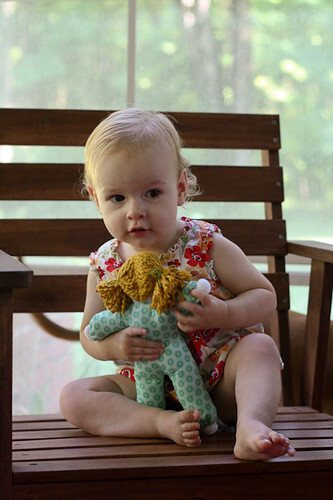 It’s adorable to see her hug and snuggle Lilly Doll. These pictures are obviously a little old (it’s cold here now! Lil looks so tiny compared to her current ginormous size! ), but Lilly Doll still gets a bit of airtime. She gets put into the doll stroller and the baby swing, and we locate her eyes, hands, feet, mouth, and hair. 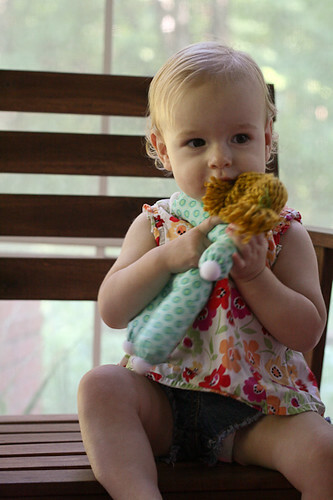 Perhaps soon I will make a little doll sling so that Lil can wear her Lilly doll. The new baby at daycare has started all sorts of baby talk around here — Lil occasionally asks to drink water from a bottle and she’ll point to herself and say, “baby”, so that I’ll pick her up and cradle her like a baby. It’s too much. I’m linking up with Kim @ Newlywoodwards for the Dare to give handmade party… where I’ll undoubtedly get a million more ideas of things to make for Lilly for Christmas. She wandered around Target with a tiny Thomas the Tank Engine backpack on the other day, so now I’m thinking maybe I’ll make her a little backpack like the ones I made for my niece and nephews last Christmas? Hmm… Too many ideas, too little time! I adore the last picture of her squeezing her baby. So sweet! Such a wonderful gift for a little one. 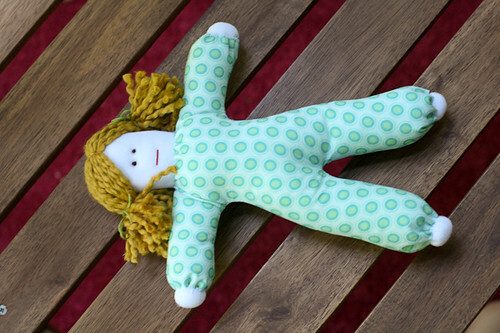 My grandmother made me a few rag-type dolls that remind me of this when I was a girl. I still love them and cherish them today. Thanks so much for linking up to Dare to DIY! Love your project!